The Lisfranc joint complex is composed of the articulation between the midfoot and forefoot. The joint is named after Jacques Lisfranc de Saint-Martin (1787–1847), a French army field surgeon who described amputation through the tarsometatarsal (TMT) joint, yet did not describe the mechanism of injury or the importance of anatomic reduction following the injury.1,2 Lisfranc injuries have traditionally been associated with high-energy trauma such as motor vehicle collisions and industrial accidents.3,4 Recently, there has been a greater appreciation of midfoot sprains that represent a spectrum of injury to the Lisfranc ligament complex.5 As a result, there has been an increased incidence of such injury resulting from low-energy trauma in activities ranging from recreational activity to elite athletic activity.6 In a study of midfoot sprains in colle- giate football players, this injury was found to be the second most-common foot injury, occurring in 4% of players annually. Twenty-nine percent of these injuries occurred in offensive linemen.7 Faciszewski and colleagues6 studied subtle injuries of the Lisfranc joint and found that 60% of patients sustained low-energy trauma (twisting mechanism), with greater than half of these injuries being sports related. Despite being associated with relatively minor radiographic changes, subtle injury can be a source of considerable morbidity in athletes. In one series, three of nineteen patients were unable to return to their sport, and one patient went on to require fusion of the TMT joint.8 Up to 20% of Lis- franc injuries can be overlooked or misdiagnosed based on initial radiographs because of a subtle diastasis. In a case series of 15 athletes who had Lisfranc injuries, 50% (4 out of 8) of the patients that had initial non-weight-bearing radiographs that appeared normal later demonstrated diastasis seen on weight-bearing radiographs.5 An under- standing of the anatomy, clinical presentation, and mechanism of injury is necessary to provide appropriate treatment for these injuries. Lisfranc joint injuries are relatively uncommon, accounting for 0.2% of all fractures, with a reported incidence rate of 1 per 55,000 people in the United States annually.9,10 They are typically the result of a high-energy trauma, such as motor vehicle accidents and falls from heights, and 58% of them are associated with polytrauma. 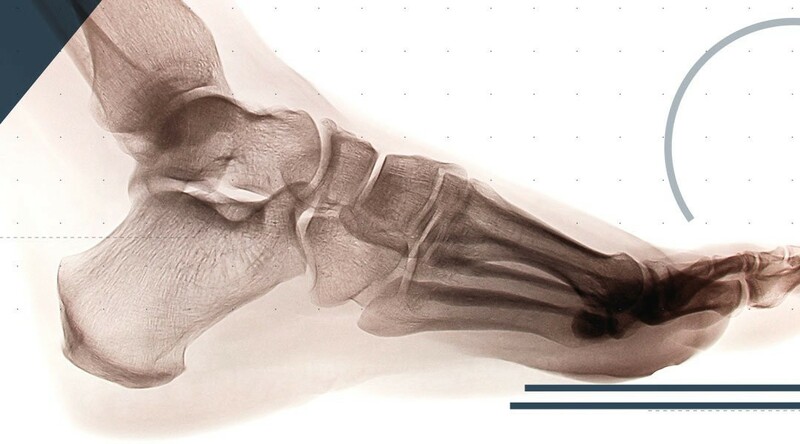 In a review of 76 cases of Lisfranc fractures and dislocations, two thirds were due to motor vehicle collision, with crush injury and fall from a height accounting for the next-largest number of incidences.4 Vuori and colleagues11 reported on Lisfranc injuries related to low- energy injuries in 32% of patients, compared with 33% due to high-energy motor vehicle collisions. Almost 40% of Lisfranc fracture dislocations in patients who had pol- ytrauma are not recognized, and 20% are misdiagnosed.12 This may contribute to the gross underestimation of these injuries, which are most common in the third decade of life, with males being affected two to four times more often than females. Unlike football and gymnastics, Lisfranc injuries are rare in dancers. This may be ex- plained by a combination of internal and external stabilizing forces. In the full-pointe position, the TMT joints are perpendicular to the longitudinal axis of weight bearing, producing more of a compressive force and less of a shear force at these joints. In a dance-related biomechanical study, it was suggested that the stability of the pointe shoe, combined with a high level of training and muscular control in the dancer, provides a protective effect for this type of injury.17 After sectioning the plantar liga- ments in a cadaveric model, a significant improvement in stability during en-pointe loading between the middle cuneiform and the base of the second metatarsal was noted in a comparison of the shod foot and the unshod foot. Nunley and Vertullo5 proposed a classification system that addresses the more- subtle, low-energy injures seen in athletics. Lisfranc sport injuries classically affect the ligamentous structures and may be associated with small fleck or avulsion frac- tures. They are primarily soft tissue injuries, and although there is no fracture, injured individuals can suffer tremendous pain and an inability to bear weight on the affected extremity. This classification system guides treatment of the low-energy Lisfranc sprains based on clinical findings, comparative weight-bearing radiographs, and bone scans (Fig. 1). Stage I is a sprain of the Lisfranc ligament with no measurable diastasis between the medial cuneiform and the base of the second metatarsal or loss of arch height on weight-bearing radiographs. Bone scintigrams will show increased uptake. This injury represents a dorsal capsular tear and sprain without elongation of the Lisfranc liga- ment. The Lisfranc complex is stable. stage II sprains result in diastasis of 1 mm to 5 mm between the base of the second metatarsal and the medial cuneiform. The dorsal ligament and interosseous ligaments are injured; however, there is no loss of arch height. Elongation or disruption of the Lisfranc ligament can be present, but the plantar capsular structures remain intact (Fig. 2). Stage III sprains result in diasta- sis of greater than 5mm and loss of arch height. This is represented by a decreased or negative value of the distance between the plantar aspect of the fifth metatarsal bone and the plantar aspect of the medial cuneiform bone on a weight-bearing lateral radio- graph.6 This injury may be associated with more-significant displacement, and in such cases, the Myerson classification should be used to describe the injury. Fig. 2. Comparison anteroposterior weight-bearing radiograph demonstrating diastasis between the base of the second metatarsal and the medial cuneiform on the right foot. In an uninjured foot, the medial aspect of the base of the second metatarsal should be aligned with the medial aspect of the medial cuneiform on the anteroposterior view. The medial aspect of the fourth metatarsal base should be aligned with the medial aspect of the cuboid on the oblique view. On the lateral view, the dorsal surface of the first and second metatarsals should be level with the corresponding cuneiforms. The most consistent radiographic finding in Lisfranc joint injuries is the loss of align- ment of the medial border of the second metatarsal with the medial border of the middle cuneiform.32 Four additional observation points include (1) the distance between the first and second metatarsal bones, (2) the distance between the medial and intermediate cuneiform bones on an anteroposterior radiograph, (3) the distance between the plantar aspect of the fifth metatarsal and the plantar medial cuneiform bones on a lateral radiograph, and (4) the presence of avulsion fractures (fleck sign).5 Comparisons should be made with the contralateral foot, and any diastasis that is 1 mm greater than that of structures in the uninjured foot should be considered diagnostic. Many authors advocate using stress radiographs for both acute and nonacute injuries. Abduction stress radiographs allow the examiner to dynamically visualize the space between the second metatarsal and second cuneiform and the space between the first cuneiform and the second metatarsal and cuneiform (longitudinal). This repre- sents dorsal displacement and might allow visualization of abnormal movement that could lead to posttraumatic arthritis. Subtle first cuneiform–second metatarsal diasta- sis is difficult to detect using abduction stress radiographs because the direction of the x-ray beam is often too oblique with respect to the joints of interest, resulting in difficulty determining the actual diastasis.36 The failure to detect a first cuneiform– second metatarsal diastasis may also be the result of dorsal translation of the first cuneiform, which may cause the three-dimensional diastasis to appear more vertically oriented. Nunley and Vertullo stage II injuries should be treated operatively with an initial attempt of closed reduction under fluoroscopy. Screw fixation is preferred, using either partially threaded, cannulated 3.5-mm or 4.5-mm screws (dependent on patient size) or fully threaded, noncannulated screws. In a review of 19 athletes, open reduc- tion and internal fixation was preferred for all patients who had diastasis, regardless of degree, despite the risk of arthritis that may be sustained from an intra-articular screw.8 Stiffness is preferred in lieu of instability to provide a rigid lever to the medial column during gait and activity. Myerson type B1 injuries should be fixed using a screw inserted from the medial cuneiform into the base of the second metatarsal and from the medial cuneiform into the intermediate cuneiform bone. Type B2 injuries should be fixed using a percu- taneous screw from the medial cuneiform into the base of the second metatarsal bone. The most important goal of surgery for Lisfranc injuries should be the anatomic reduc- tion of the TMT joints. Arthrodesis has been reserved as a salvage procedure after the failure of open reduction and internal fixation, after a delayed or missed diagnosis, or for severely comminuted intra-articular fractures of the TMT joints with a high suspi- cion of risk for posttraumatic arthritis. Some authors advocate arthrodesis as the treatment of choice for Lisfranc complex injuries. In one study of 41 patients with primarily ligamentous injury, patients treated using open reduction internal fixation (ORIF) tended to have greater loss of correction, greater deformity, and more degenerative changes than those treated using primary arthrodesis. However, arthrodesis was contraindicated for subtle injuries with minimal or no displacement.38 Kuo and colleagues39 also suggested that some patients with purely ligamentous Lisfranc injuries may be better treated using primary fusion. Mulier and colleagues40 advocated the use of open reduction and internal fixation or partial arthrodesis for severe Lisfranc injuries, and they stated that primary complete arthrod- esis should be reserved for cases of severely comminuted fractures or as a salvage procedure. The literature is in agreement on the treatment of the lateral column. When the fourth and fifth TMTs are well reduced, no procedure is necessary; however, when they are not well reduced, percutaneous reduction using Kirschner-wires (K-wires) should be performed, with removal after 6 weeks. The goal is to preserve motion in the lateral column to allow normal gait and to avoid overloading of the lateral column as the result of an iatrogenic stiff foot. Posttraumatic arthritis is rarely symptomatic in these joints. The soft tissue envelope is respected, and surgical timing is delayed until the skin wrin- kles, indicating that the swelling has subsided. Compartment syndrome is less likely in sports injuries than crush injuries. However, if it is present, fasciotomy is indicated for injuries of the foot.25 Prompt diagnosis and treatment may allow for improved outcome and better healing potential. Sangeorzan and Hansen describe the use of two incisions: a straight or lazy-S incision over the second TMT joint and a second incision between the third and fourth TMT joints, with the addition of a third, more-lateral incision when the lateral column is involved.41 Alternatively, a more medial incision is made that is deepened through the anterior tibial tendon retinaculum and subsequently repaired at the end of the procedure. The incision may also be extended if an extensive arthrodesis that includes the navicular–cuneiform joint is addressed. The extensor hallucis brevis tendon lies directly over the neurovascular bundle, which is retracted medially. A more-lateral second incision, which is centered over the midfoot, may be used in cases of involve- ment of the third TMT joint. In cases of lateral column involvement, a third incision, using the interval between the sural and superficial peroneal nerve, allows exposure of the fourth and fifth TMT articulations with the cuboid. In a meta-analysis, Desmond and Chou25 recommended a medial or dorsal incision over the first TMT joint while avoiding the first intermetatarsal space to protect the dor- salis pedis artery and deep peroneal nerve. The second incision is positioned between the second and third TMT joints, and a third incision may be added between the fourth and fifth TMT joints when the lateral column is involved. Arntz and colleagues42 sug- gested placing the medial incision in the first web space, but taking care to create full- thickness skin flaps to protect the dorsalis pedis artery under the skin bridge to prevent necrosis of the skin bridge, and they proposed placing the lateral incision between the fourth and fifth metatarsals. As an alternative, they suggested the Hann- over approach, in which the incision is extended from the second web space proxi- mally to the extensor retinaculum. The incision may then be extended proximally towards the knee when necessary. In the approach preferred by the authors of this article, the patient is placed supine on the operating room table with a calf tourniquet. An attempt at closed reduction under fluoroscopic guidance is performed. A large, pointed reduction clamp is used for the reduction, with the points positioned at the lateral aspect of the base of the second metatarsal and the medial aspect of the medial cuneiform (Fig. 3). If the joint is anatomically reduced, a fully threaded, percutaneous 3.5-mm screw is placed from the medial cuneiform to the base of the second metatarsal. If the joint cannot be anatomically reduced using percutaneous attempts, then an open approach is used. The joint is exposed through the interval between the extensor hallucis longus tendon and the deep neurovascular bundle. The dorsal interosseous ligaments will be visibly torn (Fig. 4). A rongeur can be used to remove tissue that prohibits anatomic reduction (Fig. 5). If necessary, K-wires are used to assist with provisional fixation (Fig. 6). When the joint is anatomically reduced, a guide wire is placed from the medial cuneiform to the base of the second metatarsal and a cannulated drill is used to drill the medial cuneiform only (Fig. 7). Before drilling, a guide pin is advanced through the skin on the dorsum of the foot to prevent the possibility of difficulty in removing a broken guide pin associated with drilling. After the medial cuneiform has been drilled, the guide pin is removed and a 2.5-mm drill bit is used to drill into the base of the second metatarsal. The appropriate-length screw is selected and then advanced from the medial cuneiform to the base of the second metatarsal. Fig. 3. In the authors’ preferred technique for percutaneous reduction, a large, pointed reduction clamp is used. Fig. 4. Torn dorsal Lisfranc ligaments. Care is taken to protect the soft tissues to avoid interposition of the tibialis anterior between the bone and screw (Fig. 8). Stability is examined in adjacent joints, and if there is instability between the cuneiforms or at the first TMT joints, these joints are stabilized using screw fixation. Fig. 9 is an anteroposterior radiograph that demonstrates complete reduction of the diastasis in a collegiate lacrosse player. Fig. 5. A rongeur can be used to remove interposed soft tissue. Fig. 6. K-wires are used to assist with provisional fixation. Fig. 7. During drilling of the medial cuneiform and screw advancement, the soft tissues are protected to avoid entrapment of the tibialis anterior tendon. Fig. 8. Tissues are protected to avoid entrapment of the tibialis anterior tendon. postoperative range of motion. In a study comparing the use of plantar plating to the use of transarticular screws, it was found that plantar plating was stiffer and sustained less displacement from initial to final loading.46 A biomechanical study demonstrated that dorsal plating resulted in a less stable construct compared with plantar plating, and was comparable to the use of transarticular screws.47 The primary concern with dorsal plating is soft tissue irritation postoperatively. Newer plate designs with low-profile plates and screw heads have decreased soft tissue irritation. Fig. 9. Anteroposterior radiograph demonstrating complete reduction of the diastasis in a collegiate lacrosse player. wires should be used frequently for provisional fixation or temporarily in cases of severe comminution in which screw purchase is poor. This is the preferred fixation method used for the lateral column to allow for anatomic healing without compro- mising mobility of the fourth and fifth TMT articulations. The most common problem resulting from Lisfranc injury is posttraumatic arthritis. Failure to diagnosis the injury or malreduction increases the risk of posttraumatic arthritis. Kuo and colleagues39 (level IV evidence) observed a 25% rate of arthritis in their series, and 50% (6/12) of those patients were treated using arthrodesis. Myerson and collagues,4 in their largest Lisfranc series (level IV evidence), reported an addi- tional 27 operations on 20 patients at an average of 18 months: 17 of the 27 proce- dures were performed using arthrodesis. Other procedures that were performed included exostectomy, neuroma resection, tendon lengthening, and skin grafting. Sangeorzan and colleagues50 treated 16 patients who failed initial treatment using salvage arthrodesis. The deformity was reduced, and lag screw fixation was used to stabilize the arthrodesis. Good to excellent results were achieved in 11 patients, and fair or poor results in 5 (level IV evidence). Although it is important to treat symp- tomatic arthritic joints, preservation of lateral column mobility achieved by avoidance of fourth and fifth TMT arthrodesis is advised. In Richter’s series, pedobarographic measurement results correlated with patient subjective outcomes. Only patients who did not have considerable symptoms showed a normal or near normal gait pattern.51 The results of the gait analysis, using the F- Scan in-shoe pressure monitoring system (Tekscan, Inc, Boston, Massachusetts), as performed by Teng and colleagues,53 did not show a significant difference between the injured and the noninjured foot in 11 patients. Lisfranc complex problems represent a broad spectrum of injuries. There should be a high index of suspicion of this injury, and prompt diagnosis is important to allow athletes to return to their sport with the best possible outcome. Nonoperative treat- ment is reserved for stage I sprains. The goal of operative treatment is to achieve a stable anatomic reduction. In non or minimally displaced injuries, reduction may be performed percutaneously; however, if a perfect reduction cannot be obtained, formal ORIF is recommended. Primary arthrodesis should be reserved as a salvage procedure for complex injuries with intra-articular comminution or significant displacement. A gradual return to athletics with sports-specific training is important to prevent reinjury. Despite appropriate treatment, subjective outcomes may not parallel the radiographic outcomes, and patients should be aware of the severity of the injury. Cassebaum WH. Lisfranc fracture-dislocations. Clin Orthop Relat Res 1963;30: 116. Fischer L. Jacques Lisfranc de Saint-Martin (1787–1847). Hist Sci Med 2005;39:17. Hardcastle PH, Reschauer R, Kutscha-Lissberg E, et al. Injuries to the TMT joint. Incidence, classification and treatment. J Bone Joint Surg Br 1982;64:349. Myerson MS, Fisher RT, Burgess AR, et al. Fracture dislocations of the TMT joints: end results correlated with pathology and treatment. Foot Ankle 1986;6:225. Nunley JA, Vertullo CJ. Classification, investigation, and management of midfoot sprains: Lisfranc injuries in the athlete. Am J Sports Med 2002;30:871. Faciszewski T, Burks RT, Manaster BJ. Subtle injuries of the Lisfranc joint. J Bone Joint Surg Am 1990;72:1519. Meyer SA, Callaghan JJ, Albright JP, et al. Midfoot sprains in collegiate football players. Am J Sports Med 1994;22:392. Curtis MJ, Myerson M, Szura B. Tarsometatarsal joint injuries in the athlete. Am J Sports Med 1993;21:497. Aitken AP, Poulson D. Dislocations of the TMT joint. J Bone Joint Surg Am 1963; 45-A:246. English TA. Dislocations of the metatarsal bone and adjacent toe. J Bone Joint Surg Br 1964;46:700. Vuori JP, Aro HT. Lisfranc joint injuries: trauma mechanisms and associated injuries. J Trauma 1993;35:40. Jarde O, Gaffuri JG, Woestelandt T, et al. [Fractures-luxations of the Lisfranc joint. Apropos of 39 cases]. Ann Radiol (Paris) 1991;34(4):278–84 [in French]. Clanton T. Athletic injuries to the soft tissues of the foot and ankle. 7th edition. St Louis (MO): Mosby; 1999. Harwood MI, Raikin SM. A Lisfranc fracture-dislocation in a football player. J Am Board Fam Pract 2003;16:69. Chilvers M, Donahue M, Nassar L, et al. Foot and ankle injuries in elite female gymnasts. Foot Ankle Int 2007;28:214. Ceroni D, De Rosa V, De Coulon G, et al. The importance of proper shoe gear and safety stirrups in the prevention of equestrian foot injuries. J Foot Ankle Surg 2007;46:32. Kadel N, Boenisch M, Teitz C, et al. Stability of Lisfranc joints in ballet pointe posi- tion. Foot Ankle Int 2005;26:394. Hermel MB, Gershon-Cohen J. The nutcracker fracture of the cuboid by indirect violence. Radiology 1953;60:850. Hsu JC, Chang JH, Wang SJ, et al. The nutcracker fracture of the cuboid in chil- dren: a case report. Foot Ankle Int 2004;25:423. Bentley T, Page S, Meyer D, et al. How safe is adventure tourism in New Zealand? An exploratory analysis. Appl Ergon 2001;32:327. Peicha G, Labovitz J, Seibert FJ, et al. The anatomy of the joint as a risk factor for Lisfranc dislocation and fracture-dislocation. An anatomical and radiological case control study. J Bone Joint Surg Br 2002;84:981.
de Palma L, Santucci A, Sabetta SP, et al. Anatomy of the Lisfranc joint complex. Foot Ankle Int 1997;18:356. Milankov M, Miljkovic N, Popovic N. Concomitant plantar TMT (Lisfranc) and metatarsophalangeal joint dislocations. Arch Orthop Trauma Surg 2003;123:95. Solan MC, Moorman CT III, Miyamoto RG, et al. Ligamentous restraints of the second TMT joint: a biomechanical evaluation. Foot Ankle Int 2001;22:637. Desmond EA, Chou LB. Current concepts review: Lisfranc injuries. Foot Ankle Int 2006;27:653. Root MI. Biomechanical examination of the foot. J Am Podiatry Assoc 1973;63:28. DeBenedetti MJ, Evanski PM, Waugh TR. The unreducible Lisfranc fracture. Case report and literature review. Clin Orthop Relat Res 1978;136:238–40. Komenda GA, Myerson MS, Biddinger KR. Results of arthrodesis of the TMT joints after traumatic injury. J Bone Joint Surg Am 1996;78:1665. Talarico RH, Hamilton GA, Ford LA, et al. Fracture dislocations of the TMT joints: analysis of interrater reliability in using the modified Hardcastle classification system. J Foot Ankle Surg 2006;45:300. Mullen JE, O’Malley MJ. Sprains—residual instability of subtalar, Lisfranc joints, and turf toe. Clin Sports Med 2004;23:97. Foster SC, Foster RR. Lisfranc’s TMT fracture-dislocation. Radiology 1976;120: 79. Haapamaki V, Kiuru M, Koskinen S. Lisfranc fracture-dislocation in patients with multiple trauma: diagnosis with multidetector computed tomography. Foot Ankle Int 2004;25:614. Potter HG, Deland JT, Gusmer PB, et al. Magnetic resonance imaging of the Lis- franc ligament of the foot. Foot Ankle Int 1998;19:438. Raikin SM, Elias I, Dheer S, et al. Prediction of midfoot instability in the subtle Lis- franc injury: Comparison of magnetic resonance imaging with intraoperative find- ings. J Bone Joint Surg Am 2009;91:892–9. Coss HS, Manos RE, Buoncristiani A, et al. Abduction stress and AP weightbear- ing radiography of purely ligamentous injury in the TMT joint. Foot Ankle Int 1998; 19:537. Sands AK, Grose A. Lisfranc injuries. Injury 2004;35(Suppl 2):SB71. Ly TV, Coetzee JC. Treatment of primarily ligamentous Lisfranc joint injuries: primary arthrodesis compared with open reduction and internal fixation. A prospective, randomized study. J Bone Joint Surg Am 2006;88:514. Kuo RS, Tejwani NC, Digiovanni CW, et al. Outcome after open reduction and internal fixation of Lisfranc joint injuries. J Bone Joint Surg Am 2000;82-A: 1609. Mulier T, Reynders P, Sioen W, et al. The treatment of Lisfranc injuries. Acta Orthop Belg 1997;63:82. Sangeorzan BJ, Hansen ST. Cuneiform-metatarsal (Lisfranc) arthrodesis. 2nd edition. Philadelphia: Lippincott Williams & Wilkins; 2002. p. 237–52. Arntz CT, Veith RG, Hansen ST Jr. Fractures and fracture-dislocations of the TMT joint. J Bone Joint Surg Am 1988;70:173. Mann RA, Prieskorn D, Sobel M. Mid-tarsal and TMT arthrodesis for primary degenerative osteoarthrosis or osteoarthrosis after trauma. J Bone Joint Surg Am 1996;78:1376. Vertullo CJ, Easley ME, Nunley JA. The transverse dorsal approach to the Lisfranc joint. Foot Ankle Int 2002;23:420. Lui TH. Arthroscopic TMT (Lisfranc) arthrodesis. Knee Surg Sports Traumatol Ar- throsc 2007;15:671. Marks RM, Parks BG, Schon LC. Midfoot fusion technique for neuroarthropathic feet: biomechanical analysis and rationale. Foot Ankle Int 1998;19:507. Sangeorzan BJ, Hansen ST Jr. Early and late posttraumatic foot reconstruction. Clin Orthop Relat Res 1989;243:86–91. Thordarson DB, Hurvitz G. PLA screw fixation of Lisfranc injuries. Foot Ankle Int 2002;23:1003. Thordarson DB, Hedman TP, Gross D, et al. Biomechanical evaluation of polylac- tide absorbable screws used for syndesmosis injury repair. Foot Ankle Int 1997; 18:622. Sangeorzan BJ, Veith RG, Hansen ST Jr. Salvage of Lisfranc’s TMT joint by arthrodesis. Foot Ankle 1990;10:193. Richter M, Wippermann B, Krettek C, et al. Fractures and fracture dislocations of the midfoot: occurrence, causes and long-term results. Foot Ankle Int 2001;22: 392. Shapiro MS, Wascher DC, Finerman GA. Rupture of Lisfranc’s ligament in athletes. Am J Sports Med 1994;22:687. Teng AL, Pinzur MS, Lomasney L, et al. Functional outcome following anatomic restoration of tarsal-metatarsal fracture dislocation. Foot Ankle Int 2002;23:922.